Federal law prohibits the cultivation, sale and consumption of cannabis products within the borders of the United States. The majority of states have passed laws in contradiction to this edict (33 states and two territories have legalized medical marijuana; 10 others and the District of Columbia have legalized recreational cannabis), but the federal government can enforce or ignore these laws at its discretion. One way to end this conflict is to pass a constitutional amendment that removes cannabis from the list of controlled substances the federal government is allowed to regulate. Serious discussion of such an amendment has yet to begin, but that could change when it’s realized how insecure the status of state-by-state legal cannabis really is. There are two ways to amend the US Constitution, as delineated in Article V.
First, Congress can send a proposed amendment to the states for ratification, requiring a two-thirds voting majority in both the Senate and House of Representatives. From there, the amendment must be ratified by three-quarters of state legislatures (38 total) before it can be added to the Constitution. Alternatively, two-thirds of state legislatures (34) can pass proclamations calling for a constitutional convention, in which delegates sent by the states would vote on any proposed amendments. With the delegates acting as proxies, three-quarters of the states would need to vote to approve any proposed amendment before it could be added to the Constitution. Many states have petitioned for a constitutional convention in the past, but the number of states calling for one has never surpassed the critical threshold. Consequently, all 27 amendments added to the Constitution since the republic’s founding have originated through congressional initiative. It’s important to clarify what a constitutional amendment ending federal cannabis prohibition wouldn’tdo, which is instantly make recreational marijuana legal everywhere in the land. Such an amendment would likely be modeled after the one that ended the prohibition of alcohol in 1933. The 21st Amendment overturned the federal ban on the manufacture, sale and transportation of intoxicating liquors, but left it up to individual states to decide whether to legalize alcohol and how to regulate its production and distribution. Under the terms of this hypothetical amendment, the decision by North Dakota voters in this year’s midterm elections to reject the legalization of recreational cannabis would be honored and respected. Likewise, the decision by voters in Michigan to legalize recreational cannabis would also be respected. The dominoes of state laws enforcing prohibition would be left to tumble at their own pace in response to evolving public opinion as expressed through referendum. When dissecting the issue along partisan lines, the general assumption is that Democrats are largely in favor of legalizing recreational cannabis, while Republicans are largely opposed. 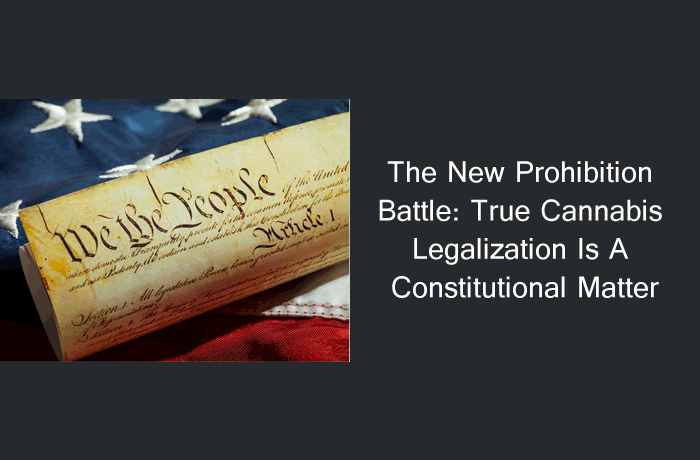 With Republicans currently controlling the US Senate and the majority of state legislatures, this would seem to preclude the passage of a constitutional amendment lifting the federal ban on cannabis. However, the politics of cannabis are in flux, and in the present climate, simplistic partisan analysis may be an unreliable guide. The most recent Gallup Pollshows that 53 percent of Republicans now support the legalization of recreational cannabis (the percentage is more than 60 percent among Republican voters younger than 40), which represents an increase of 11 percent in just the last two years. Additionally, 71 percent of independents in the same poll affirmed their support for full legalization, and with Gallup asserting that 42 percent of voters now identifying as independent, neither party can afford to ignore the wishes of these swing voters. Emboldened by the shifting sands of public opinion, libertarian principles and a commitment to states’ rights, an increasing number of Republican legislators and donors have been speaking out against the irrationalities of the federal government’s cannabis policies. This includes the highly influential — and equally notorious — Koch brothers, who spent $400 million on the 2018 elections alone in support of Republican politicians. Charles and David Koch are anathema to the left, but they’re staunch libertarians who’ve condemned the war on drugs and who would prefer to leave the question of marijuana prohibition entirely up to the states. When former Attorney General Jeff Sessions announced his intention earlier this year to ramp up cannabis prosecutions in states where medical and/or recreational pot are legal, the reaction from the libertarian right was swift and negative. The Koch brothers issued a statement that strongly condemned Sessions’ actions, and five congressional Republicans joined four of their Democratic colleagues in sponsoring theStrengthening the Tenth Amendment Through Entrusting States (STATES) Act, which would reaffirm each state’s right to choose its own course on cannabis and prevent federal law enforcement officials from interfering with that right in any way. “It’s a federalism experiment,” explains Republican Senator Cory Gardner of Colorado, who created the STATES Act in collaboration with Democrat Senator Elizabeth Warren of Massachusetts. “Republicans who have long been champions of states’ rights can choose this moment to prove it.” President Trump has already said he will likely sign this bill if it passes, which is yet another indication that times are truly changing. With more states lining up to legalize or decriminalize cannabis, passing a constitutional amendment that removes cannabis from the federal government’s list of controlled substances might seem superfluous or redundant. In United States v. Oakland Cannabis Buyers’ Cooperative(2001) and Gonzales v. Raich(2005), the US Supreme Court reaffirmed the right of the federal government to prosecute “crimes” related to cannabis cultivation, production, sale, possession and use, even in states where cannabis products are legal for medical or recreational purposes. The federal government has discretion in this regard and can choose to be lenient, but if a serving attorney general unleashed orders to vigorously enforce federal laws banning cannabis in all 50 states and Puerto Rico, they would be free to do so (a prerogative Sessions was anxious to exercise). The only sure way to protect state cannabis laws from the enmity of fanatical attorneys general or federal prosecutors is to pass a constitutional amendment decriminalizing cannabis unconditionally. Despite changes in Republican sentiments, a Democratic control of Congress and a few more state legislatures may still be necessary to tip the scales in a favorable direction. Not to mention, actual movement to push for such an amendment would need to arise. But neither development is far-fetched, given the mercurial nature of electoral politics and the momentum that the legalization movement is gaining across the country.